Cathodic Protection (CP) is one of the most effective methods for preventing most types of corrosion on a metal surface. In some cases, CP can even stop corrosion damage from occurring. Metals, especially ferrous metals, corrode in the presence of oxygen, water, and other impurities such as sulfur. Without CP, metals act as the anode and easily lose their electrons and thus, the metal becomes oxidized and corroded. CP simply supplies the metal with electrons from an external source, making it a cathode. The following are two helpful mnemonics to remember how electrons are transferred in oxidation-reduction (redox) reactions. Galvanic cathodic protection involves protecting a metal surface of a piece of equipment using another metal that is more reactive. The latter metal, usually called the galvanic or sacrificial anode, has a less negative electrochemical potential compared to the metal component being protected. Therefore, the sacrificial anode undergoes oxidation rather than the operating equipment. 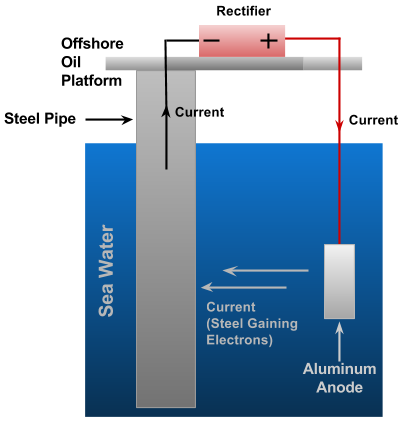 This technique is illustrated in Figure 1 below for an offshore platform with a steel pipe submerged into seawater. The sacrificial anode is an aluminum anode in this example. 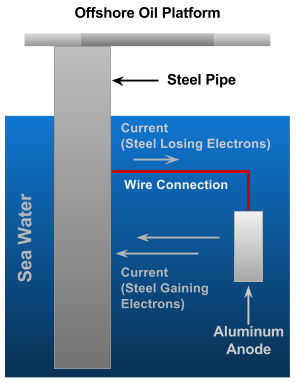 Sometimes, steels are galvanized rather than connected to galvanic anodes. Galvanized steels are steels that are coated with a protective zinc layer. The zinc layer acts to cathodically protect steel against corrosion in most underground and marine environments. Figure 1. Offshore oil rig using a sacrificial anode. ICCP is a more economical method of CP when underground pipelines are long or offshore equipment is too large to protect via one or few galvanic anodes. In ICCP, electrons are supplied to the cathodic structure using an external DC power source (also called a rectifier). The steel component is connected to the negative terminal of the power source and the impressed current anodes are connected to the positive terminal of the power source. For simplicity, Figure 2 shows one cathode and one anode connected by a rectifier. In application, multiple anodes are connected to the positive terminal of the power source. Figure 2. Offshore oil rig using an impressed current. Cathodic protection is routinely used to protect equipment operating in aggressive environments. The two most common applications of CP are for buried pipeline systems and vessels as well as offshore platforms. CP is not used to protect equipment in atmospheric conditions or protect components internally. Once installed, CP should be monitored and maintained. Furthermore, inadequate CP designs may not maximize the amount of current reaching the protected item. CP designs should consider the environmental conditions and the component to be protected against corrosion. Another critical factor to monitor is stray currents that may interfere with the system. These interfering currents could be due to the environment or neighboring components (especially if new equipment is commissioned). Additionally, the anodes and rectifiers must be maintained in order for CP to be effective and reliable.